Sensitive Teeth? Dang, They Are A PAIN! 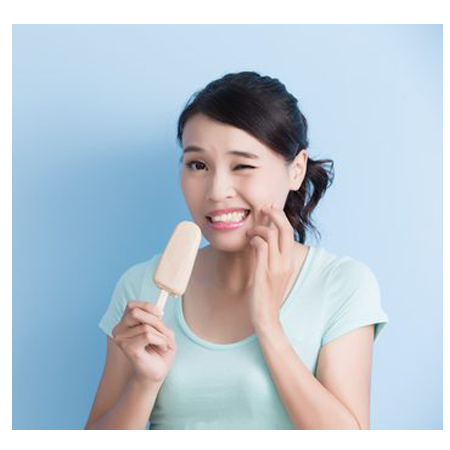 Do you cringe at the thought of taking a bite of ice cream or a sip of hot coffee because it makes your teeth hurt? Does brushing or flossing your teeth cause pain? If so, you may have sensitive teeth. You may experience discomfort or pain when you eat or drink hot, cold, sweet, sour, or very acidic foods and beverages. You may also experience discomfort when breathing in cold air. Tooth sensitivity may come and go, or it may be continuous. Tooth or dentin hypersensitivity is a harmless, but sometimes painful, condition that occurs in up to 60% of people. While temporary tooth sensitivity may happen, if sensitivity lasts more than a week, you should call Sandy for an appointment, just so we can help determine the cause and ensure that it is nothing serious. There is no reason to suffer with tooth sensitivity when we can suggest treatments that can alleviate your discomfort. So, What Exactly is Tooth Sensitivity? Okay, just remember that YOU asked? A layer of enamel protects the part of your tooth above the gum line, known as the crown. (Yep, here we go with parts of the tooth – did you pay attention to our previous blog? It was riveting. So here’s the link just in case you can’t wait another second – https://wp.me/p84DRh-y) Underneath that gum line, there is a different protective layer called the cementum that protects the roots. And underneath both the enamel and the cementum, there is a less dense layer called dentin. When dentin loses its protective coating of enamel or cementum, hot, cold, acidic, or sticky foods can reach the nerves inside the tooth and cause pain. So, How Do We Treat Tooth Sensitivity? Desensitizing toothpaste: A specially-formulated toothpaste that can help block the transmission of pain sensation from the tooth surface to the nerve, resulting in reduced sensitivity. Desensitizing rinses: Usually developed with high levels of fluoride, desensitizing rinses can also help relieve pain. Fluoride gel or varnish: Your dentist can apply fluoride directly to your sensitive tooth to strengthen the enamel and decrease its sensitivity. A crown, inlay, or bonding: These dental procedures can correct a flaw or decay in your tooth that may be causing pain. Surgical gum graft: If you’ve lost gum tissue from the root, you can have gum tissue taken from another area and attach it to the affected area, thus protecting the exposed roots and reducing pain. Get your bite adjusted: Some teeth may chew with more pressure or force causing trauma leading to teeth being more sensitive. We have patients who have had HUGE benefits from this treatment, for which Dr. Sable has trained for many years! Okay, Your Teeth Don’t Hurt YET? What Do You Do? Don’t brush your teeth with abrasive toothpastes. Tartar control and “whitening” toothpastes can be very abrasive, opening up the pores in the teeth. If you are concerned with whitening, speak to Dr. Sable about better options than these toothpastes. Don’t do more damage than good! Avoid foods and drinks high in acid or sugar. The foods and drinks your dentist warned you about as a child still apply. Foods or drinks such as soda, sticky candy (OH NO…JUST IN TIME FOR HALLOWEEN! ), or anything high in sugar content can weaken your enamel. Reach for snacks like fruits, vegetables, and low-fat dairy products to keep your teeth and enamel healthy. Not only are these snacks healthier in general, but they also keep your enamel strong by helping you produce saliva – a natural defense against acid and bacteria. Avoid clenching or grinding your teeth. Grinding your teeth can wear away your tooth enamel. If you clench or grind your teeth (or think you do!) while you sleep, let us know. It is worth having this conversation to prevent longer term damage! We may recommend a custom-fit mouth guard. In severe cases, muscle relaxants may be prescribed. Stop bleaching your teeth. This popular cosmetic procedure might make your teeth brighter and whiter, but it can be the source of temporary tooth sensitivity. Consider taking a break from bleaching your teeth to see if it improves your sensitivity. If you have tooth sensitivity, give us a call today. Pain does not need to become part of your life. There are ways to mitigate your sensitivity and get you back to enjoying the foods and drinks you love. We want you to breath easy and enjoy life with a natural, beautiful smile!